From the Sub Zero recipe of the week series brought to you by C&W Appliance Service. Crushed tomatoes, pesto, mozzarella cheese, Parmesan cheese, olive oil, cooked meat, etc. Position oven racks to rack position 3 and 1. Preheat Wolf electric oven in PROOF* at 90°F. Place water into a small bowl and add yeast. Quickly stir and set aside for five minutes to activate yeast. Place flour, sugar, salt and 6 tablespoons olive oil in large mixer bowl. Pour yeast mixture into the bowl. Using rubber scraper, combine mixture, scraping sides and bottom of the bowl often until the flour has been absorbed. Using mixer with dough hook, continue to knead the dough at lowest speed for 7 minutes. Remove dough from the bowl onto lightly floured surface. Divide dough in half and roll each portion into a ball. Coat the inside of 2 medium bowls with a teaspoon olive oil. Place one ball in each bowl and place the bowls on rack 3. In a pie plate pour 1 cup warm water and place on rack 1 in oven. Close the oven door. Proof for 60 minutes. Prepare pizza ingredients while the dough rises**. Remove dough and water from oven. Position bakestone rack and bakestone in Wolf oven in rack position 1 (lowest position). Preheat oven in BAKESTONE at 500°F (260°C). Allow about 45 minutes for oven to preheat. Generously coat a work surface with flour or cornmeal. Turn out dough onto countertop. Press and gently stretch dough until it is about 14 inches in diameter. Slide the pizza peel under the dough and slide the dough onto the preheated stone. Bake for 2 minutes. Remove the dough and place on the counter. Top with ingredients and return to the oven for an additional 6 to 9 minutes, depending on the toppings. After removing the finished pizza, let cool on the counter for 3 to 5 minutes before slicing. *If the oven doesn’t have a PROOF button consult your Wolf Use and Care Guide for instructions on how to enter this mode. Brush one crust with 2 teaspoons olive oil and sprinkle 1/4-1/2 cup grated fresh Parmesan cheese around the edge of the crust. 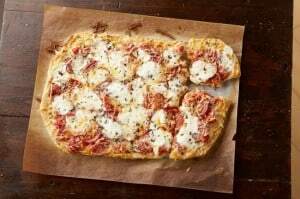 Top with 3/4 cup crushed tomatoes, 2 tablespoons fresh chopped oregano, 1/2 pound thinly sliced fresh mozzarella cheese, 1/4 pound shredded mozzarella cheese and sliced pepperoni. Prepared pizza sauce or crushed tomatoes add a fresher, lighter flavor. To use crushed tomatoes, pour into a strainer and drain for five minutes before using. Each 14″ pizza uses between 1/4 to 3/4 pound mozzarella cheese. Thinly sliced fresh (or smoked) mozzarella adds a lighter flavor and texture. Shredded mozzarella cheese can give a brown top. For Sub-Zero repair Dallas and Fort Worth call the ONLY Sub-Zero Factory Certified Service Partner in Dallas at (214) 358-1496.